One of the colors I always seem to reach for on these warm, sunny days is yellow. It's such a happy color and instantly brightens any look! Funny thing, and I think I've mentioned this before, but I never used to wear it; I thought it wasn't a very flattering color on me and steered clear of it. Fast forward several years later and it's become one of my favorite colors to wear. I seem to be more drawn to the richer, mustard or marigold shades of yellow, which brings me to this little lace dress! This marigold-lace dress is absolutely darling! I can't believe it's a mere $20! The lace detailing alone makes it look far more expensive than it is -- I was surprisingly impressed with the quality when I first saw it in-person! The lace is very intricate with varied floral paneling and contrasting peek-a-boo crochet trim throughout. It's really feminine and beautiful, and I just adore it! It would be perfect for Spring/Summer break vacations, weddings, bridal/baby showers, brunch, or just because! I love it as a weekend-style dress, too, and wore this look out to a Sunday lunch date where we dined al-fresco. The color is such a pretty shade and is much richer than it photographs here. It's a true shade of marigold-yellow and is so lovely for Spring/Summer! As I mentioned, the quality for this dress is great for the price point. It's fully-lined and zips easily up the back. It's not sheer at all except for the hem of the dress, which I like because it really showcases the scalloped lace trim along the bottom -- another pretty detail I love about it. It's such a sweet fit-and-flare style, too, and so flattering! I'm wearing size XS and it fits nicely with still plenty of room to move freely. The lace doesn't have any stretch, so it's nice that it's not too tight or constricting. For sizing/fit reference, I'm a petite 5'2", measuring 33-24.5-35 in the bust, waist, and hips, respectively, and weigh about 100 lbs. As you can see, the dress is a shorter length, hitting me a few inches above the knee. If you're much taller than me, it may approach mini length on you, so just something to keep in mind. Because of the length, this isn't a dress I would wear to work, but I know that office dress codes vary widely by company and industry, so if it's acceptable in your workplace, then by all means wear it! It looks darling on its own or with a jacket like I'm wearing here. A cardigan or blazer would look nice with it, too. I love a yellow-and-blue color pairing! The colors work so well together, don't they? 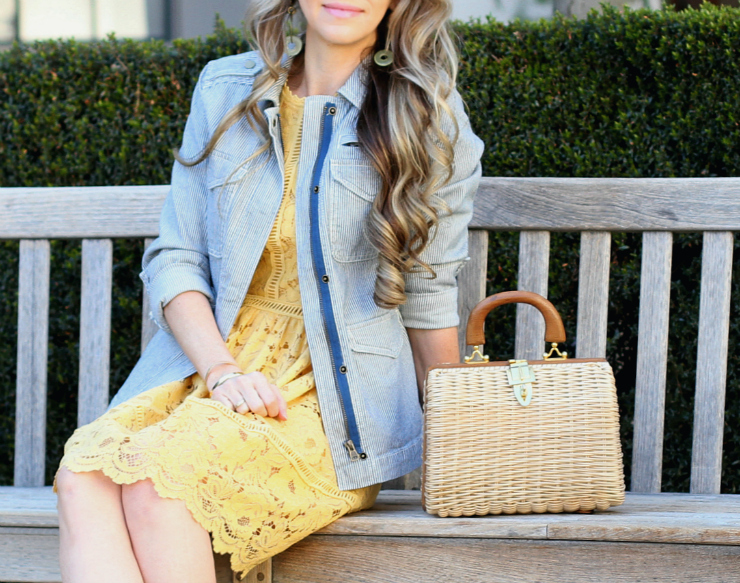 This lightweight denim jacket is an oldie-but-goodie from LOFT a couple of years back, but I was able to find a couple of the exact same ones online for you here and here if you're interested. I like that it's more structured than the typical denim jacket with its shoulder epaulets, front packets, and snap/zipper combo. The micro stripes are such a fun detail, too -- they really pop against the yellow lace of the dress. Another cute, lighter-wash, denim jacket is here, which would be a great, versatile option for layering, too. A vintage wicker bag works so well with this look -- I just love this little bag so much! If you've been looking for something similar, I found a couple of really cute ones online here, here, and here! Straw and wicker bags are a must-have this time of year, and in case you missed it, I rounded up several of them in all shapes, sizes and price points on my new VACATION SHOP blog page! My sandals, sunnies, and earrings are all older, but I found a few similar pairs of gingham sandals here, here, and here that I'm loving; similar glasses here; and similar earrings here. Lipstick in "Creme Cup" & Lipgloss in "Tell Me Dior"
Thanks so much for stopping by! I hope you're enjoying warm and sunny temps where you are, and if not, that you will be very soon!